How do I save/convert this PDF to one of those image formats? EDIT: One way I've found to do this is to click on each page. Copy to clipboard. Paste to Paint.net and then save. However, this is cumbersome as it appears you can only select one page at a time in Acrobat Reader. Please pay close attention to pooryorick's answer, in which he points out how sleske's answer is actually a much better answer for this particular problem. There are multiple png pseudo-devices, differentiating on color depth: pngmono, pnggray, png16, png256, png16m, and pngalpha. Choose whichever one suits you the best. You can also use jpeg, but unless you have a disk space issue, you want as high a quality as you can manage for your OCR, and that's not jpeg. GhostScript no longer has support for gif, but I can't imagine why you'd need that, what with png256 support. The output will be 1 jpg file for each page in your pdf, test-0.jpg, test-1.jpg, etc. There's also pdfimages from the Xpdf tools (available from the site of XpdfReader). It will not convert a whole PDF page to an image, rather it will extract embedded images from a PDF. This is useful if the PDF contains text and images, and you want only the images. Also, it will extract the images in their original format, so no loss of quality is involved (unlike programs which render the whole page and then convert it to e.g. JPEG). Depending on your needs this might be useful. This will read the input file mydocument.pdf, extract all images and write them to individual files named mydocument-images-0000.jpg, mydocument-images-0001.jpg etc. Option -j makes it write embedded JPEG-compressed images as JPEG files, not as PBM/PGM/PPM files (which are uncompressed and huge). Note that images may still be written as PBM/PGM/PPM files, if that's how they were stored in the PDF input file. Click the image. It will be highlighted. Copy (Ctrl-C) and paste it into Paint. Save as any file type you like. Except for the answer mentioning pdfimages, all of the other answers fail to mention that their solutions actually transcode the embedded images. I.e., those solutions do not simply extract the original image, but modify it, possibly to the detriment of the image, during the process. Only pdfimages extracts the original image. This is true of Ghostscript, Imagemagick, Adobe Reader, PDFFill, PDF Xchange Viewer, OS X Preview, and most other PDF software. 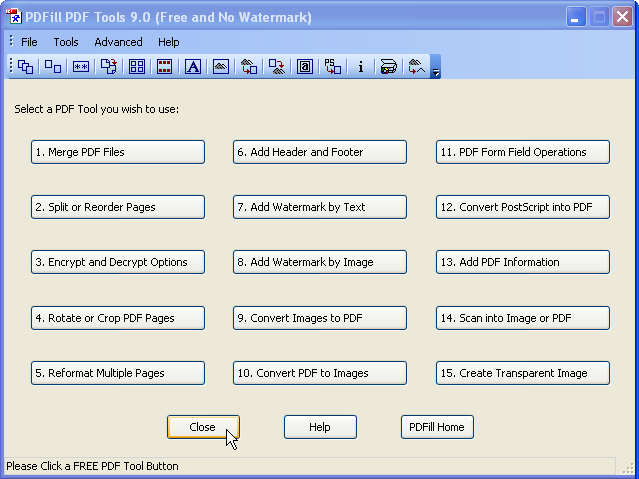 PDFill PDF Tools is probably the easist way to convert your PDFs to images on Windows. It'll let you export all the pages in the PDF to separate images in one shot. It also has a lot of other features available for free, which are only available in other PDF viewers if you purchase the commercial or "Pro" version. Use the "Convert PDF to Images" button (button #10) in the screenshot below. Also PDF Xchange Viewer (Free) will do export-to-file. File → Export → Export to image. Not only that, but I think it's the best free PDF viewer for Windows, and it has some nice markup capabilities. I have a license for Adobe Acrobat and I still prefer this unless I'm doing extensive editing, which is rarely. 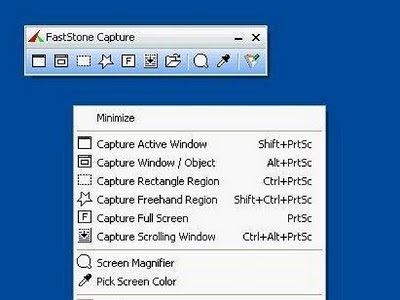 If the image exceeds the size of you screen, you may use FastStone Capture (the "Capture Scrolling Window" feature) and save the image as a JPEG. You can check out this article. It lists out 6 different ways to convert the pdf into images. Not the answer you're looking for? Browse other questions tagged images pdf or ask your own question. How to convert a multi-page PDF file to PNG files, with one PNG file per page of the PDF document? When a PDF file only contains a scanned image, is it just a JPG image inside a PDF container? How to ascertain dpi of image inside a PDF file? How to combine multiple file types into a single PDF?